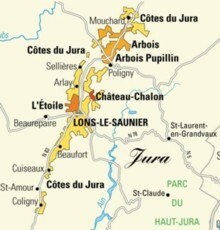 The Jura’s vineyards (‘department’ number 39, Lons-le-Saunier) have the medieval town of Arbois as their capital. The wine route stretches from north to south over 80 km or 50 miles from Salins-les-Bains to Saint-Amour, along a green strip of land (composed of red and blue clay-limestone marl) called the Revermont, on the N83 main road. Before the vineyards were destroyed by phylloxera (1888), the region had 20,000 hectares of vines. It was in his Rosières vineyard in Arbois where Louis Pasteur undertook his experiments in fermentation. Arbois, the first AOC set up (15th May 1936), and Arbois-Pupillin: dry whites, rosés, reds, ‘jaune’ or yellow wine (see below) and sparkling. Côtes du Jura: whites, whites ‘typical of the area’, rosés, reds, ‘vin jaune’, sweet ‘vins de paille’ (made from dried grapes – see below), ‘macvin’ (wine liqueur – see below), sparkling and ‘Marc du Jura’ (grape must based spirit). L'Etoile: white, ‘jaune’ and sparkling wines. The five Jura grape varieties are: Trousseau, Poulsard, Pinot Noir, Chardonnay and Savagnin. Picked very late (after All Saints Day, 1st November), the grapes (Savagnin variety) are pressed and slowly fermented, then the wine is aged in 228 litre oak casks for at least 6 years and 3 months without racking or ullage. A film of yeast grows on the surface protecting the wine from the air and hence oxidation. In these conditions it forms complex aromas and is bottled after ageing. The bottles are unique, holding 62cl (the missing 38cl from a litre make up ‘la part des anges’, or angels’ share, which evaporates during six years ageing); they’re called ‘clavelins.’ It keeps for a long time; several centuries even. Open it 24 hours before drinking, and taste at 14 – 16°C. It’s made from grapes picked very ripe (Savagnin, Chardonnay, Poulsard), dried out for at least six weeks on straw mats (just like at Stéphane Tissot’s) or on chalk or hung up. This technique concentrates the sugars. After pressing, a slow fermentation gives a sweet wine with between 14.5° and 17° alcohol. It’s aged for 3 years in small barrels. A mix of 2/3 grape must and one third ‘marc’ (grape spirit) is aged for at least 12 months in oak. It has between 16° and 22° alcohol.